Sometimes reeling-in the catch of your life can mean the end of your life. Machiko Noguchi, the last survivor of the colony on Ryushi, is journeying aboard a massive Predator ship when a freshly caught Alien Queen snaps her tethers, destroying all in her path. Unfortunately for her, Machiko is in that path.<br />This thrilling tale collects the Aliens vs. Predator story serialized in issues #1-#14 of the Dark Horse Insider, with additional interior art by Stradley and Warner and a brain-smashing cover by the spectacular Richard Corben! This special issue serves as the heart-pounding prelude to Aliens vs. 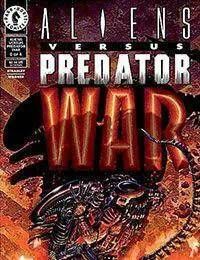 Predator: War.